Many early educators spend the first few weeks of school helping children read and write color words. Color words (brown, red, yellow, green, blue, purple, etc) are useful for young readers and writers. The ability to read color words helps children to follow directions independently on assignments. It allows kids to add details to their writing. Plus, reading color words builds a bigger reading vocabulary. 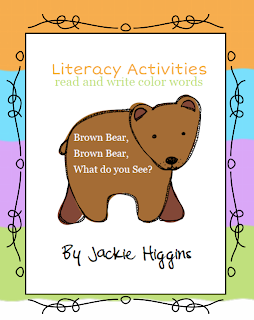 One of my favorite books for teaching color words is "Brown Bear, Brown Bear, What do you See?" by Bill Martin Jr. This is a classic book with a repetitive text. Kids are able to read closely to find color words because the rest of the text becomes so familiar in just a few readings. After reading the book, knowledge of color words can be built through fun, hands on activities and games. It's important to introduce color words in both reading and writing. We recently explored some fun activities with color words in reading and in writing. Brown Bear, Brown Bear What do you See? by Bill Martin Jr. follows a pattern on each page as each animal introduces the next animal in the story. The text begins, "Brown bear, brown bear what do you see? I see a red bird looking at me." 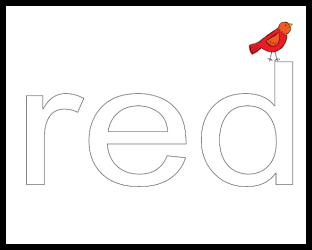 The red bird picks up the pattern on the next page and continues the pattern through out. It is a great book for teaching color words. As you read through the book Brown Bear Brown Bear What do you See?, have students locate and frame color words. Provide students with animal pictures and color word cards. Have students work to match the animal picture to the correct color word. Discuss strategies for locating the correct color word (ie. checking beginning letter sounds, looking at the shape of the word, looking at the length of the word, saying the sounds slowly to sound out the word). I have created a pre-made version of this game in my Brown Bear, Brown Bear Mini Unit below. Scroll down for more details. I created a retelling game by creating cards with pictures of each animal or character from the story. At the top of the card, I wrote a sentence about the next character. For example, I placed a picture of a brown bear on the card and then wrote the sentence, "I see a red bird looking at me." Use this story retelling game in small groups or as a whole class. You will need at least 10 players. Each player should look at the picture on the card to determine the assigned character. The player will listen for another player to say the character’s name on his or her card and then read the sentence at the top of the card. This is similar to “I have. Who has?” The teacher may want to begin the game with the teacher card. In order to write color words, students need to slow down and look at each letter in the word. Forming the words with playdough is a fun way to get kids to examine the letters in a word. You can write out the word on a piece of paper for children to create a playdough mat. Provide each student with a playdough mat. Read the word together. Have the student roll playdough into snake like rolls and form the letters of each word in order to spell the color words. 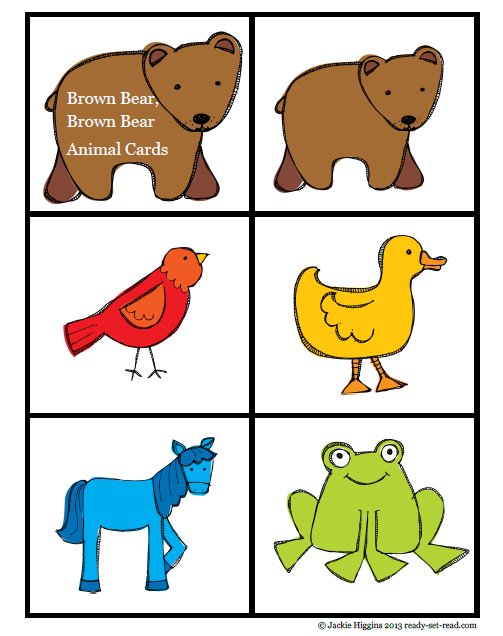 If you would like additional practice with color words, check out these Brown Bear, Brown Bear Coloring pages. 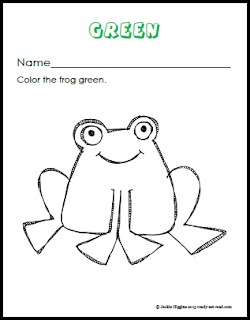 These worksheets are included in my Brown Bear, Brown Bear Mini Unit. Have students read the color word at the top and color the animal to match. You could staple the pages together to make a nice book for retelling the story. This could be created individually or as a class. Save time by purchasing Brown Bear Brown Bear ready-made activities in my teachers pay teachers store. You'll find all of these activities with cute and clear clip art. What is your favorite book for teaching color words? I will try it my five year old, she loves this book, she has it memorized. :) thank you for sharing.